The pink, the rose of England shows. St. Andrew’s Cross displays the white. Then hail; the pink, the white, the green. Our patriot flag’ long may it stand. To form the flag of Newfoundland! Fling out the flag, o’er creek and cragg. Pink, white and green, so fair, so grand. Around the shores of Newfoundland! Our native flag, o’er hearth and home. The flag we honor and revere! Long may it sway, o’er bight and bay. Author SDMPosted on May 22, 2016 May 24, 2016 Categories PostsTags Flag Design, Heraldry, Provincial Flags3 Comments on What’s Wrong With This Picture? 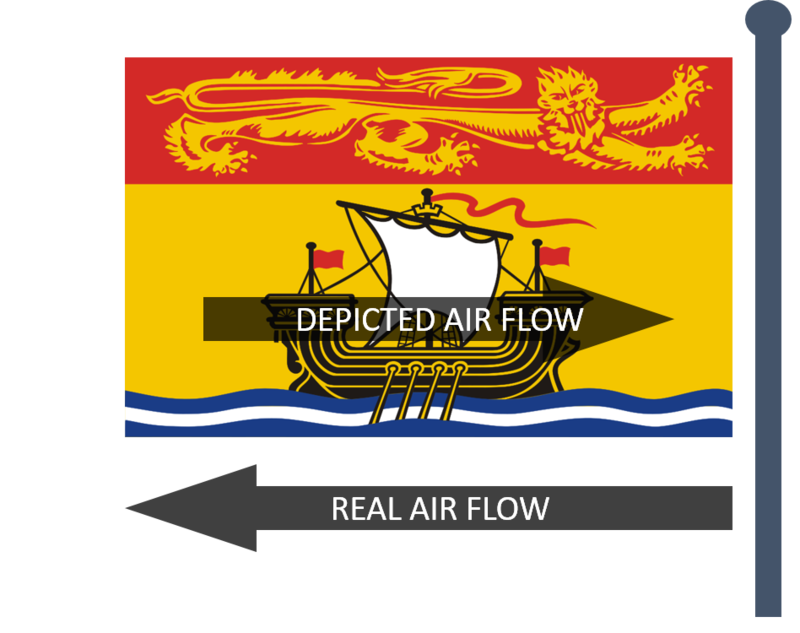 Yesterday marked the 50th anniversary of the flag of the Canadian province of New Brunswick. 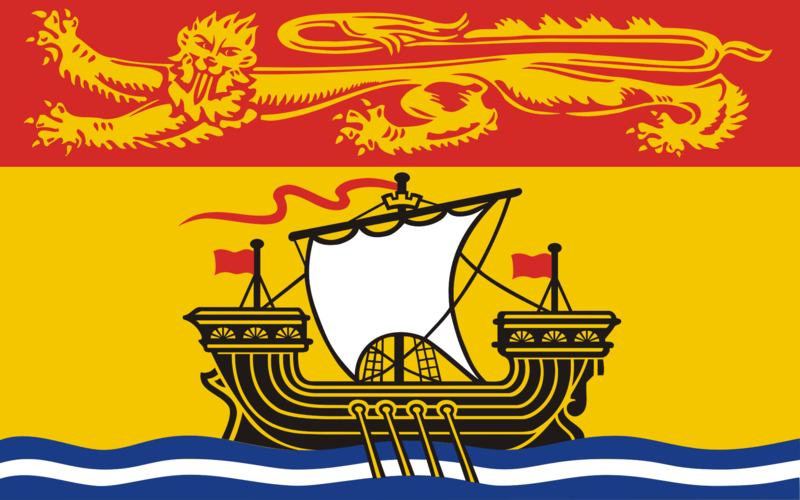 The flag of the Canadian Maritime province of New Brunswick, an armorial banner of the provincial coat of arms. Graphic design by Alan J. Beddoe. Adopted 24 February 1965. Is it a coincidence that both this flag and the Maple Leaf flag of Canada both celebrated 50 year anniversaries this February? As explained by Alistair B. Fraser in his book Flags of Canada, it most certainly is not! In the early 1960s the armorial banner of the province had been used as a distinguishing flag on the Premier’s car on special occasions…. But no attempt was made to transform this flag into a provincial flag until it was driven by political expediency in the early days of 1965. The Parliament in Ottawa had just adopted the National Flag which became official on February 15. In various places in the country, including New Brunswick, imperialist sentiment sought to recapture the lost Red Ensign by turning it into a provincial flag. It was this sentiment, or at least fear of it, which prompted the government of Premier Lois-J. Robichaud to adopt instead the armorial banner. It happened as follows. Just before the sitting of the Legislative Assembly in early 1965, both Premier Robichaud and his Executive Assistant were on holidays. This left the Robert Pichette, the Administrative Assistant, to hold down the fort in the Premier’s Office. In strictest confidence, Pichette received word from an acquaintance that the Opposition had agreed on a parliamentary strategy for the upcoming Session: they would not debate the traditional Speech from the Throne, but instead would introduce a motion calling for the Red Ensign bearing the arms of the Province to become the official flag of New Brunswick. This would not only have caught the government off guard, it would have undercut government support. The government, led by an Acadian, would have had to oppose the motion, unavoidably alienating many of the Anglophones. The only recourse Robert Pichette had open was to undercut the Opposition by having the government proclaim a provincial flag, but he had to act quickly before the opening of the next Session. 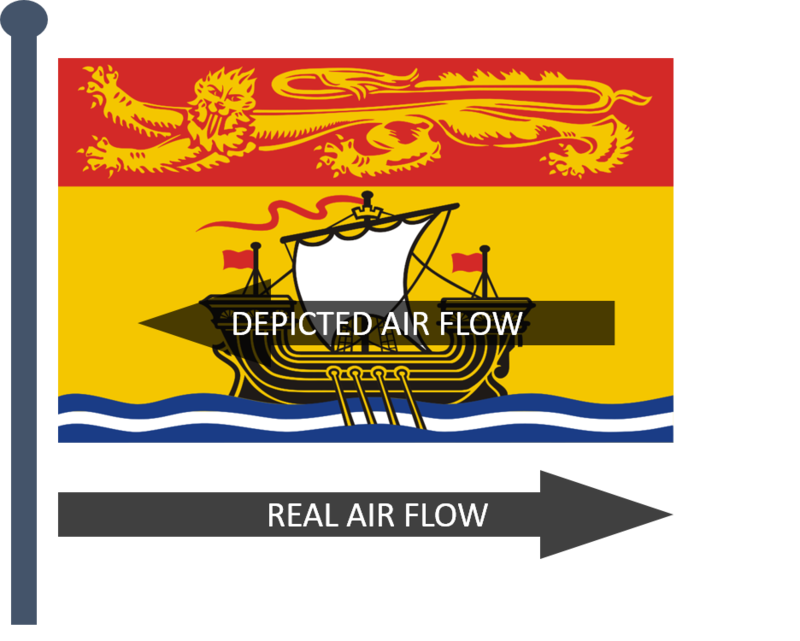 Heraldically knowledgeable, Pichette chose to transform New Brunswick’s armorial banner into its provincial flag. To do this, he sought help from an old friend from his days in the RCAF, Lt. Commander Alan J. Beddoe. He hardly could have chosen anyone better: Beddoe was Canada’s leading heraldic artist and, among other things, the man responsible for the 1957 revisions to the Arms of Canada. Upon his return, Premier Robichaud was presented with both the political problem, and its heraldic solution, in the form of one of the prototypes athwart the wall of his personal office. Robichaud smiled and said, “We’ll do it, but there is something missing on your flag.” Sure enough, no one had previously noticed that lymphad’s oars were missing. A quick trip to a local seamstress solved that, and with the surreptitious printing of some informational brochures for M.L.A.s and the press, all was ready for the surprise announcement during the Speech from the Throne. Has any other flag’s creation been the result of such political intrigue — and quick thinking by an administrative assistant?